The synergies created by leading companies achieve greater benefit to their customers. 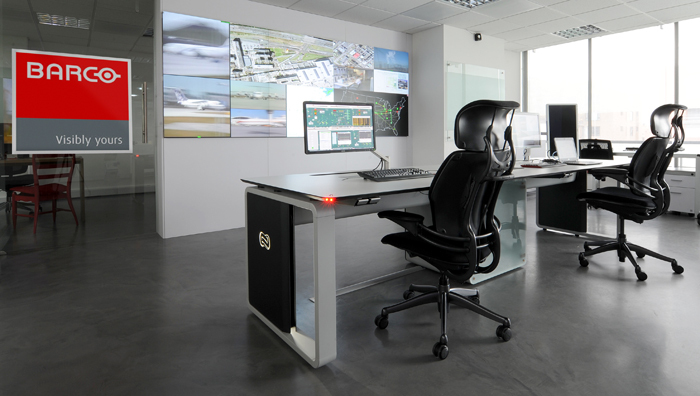 With this philosophy, both Barco and GESAB have spent years working closely on the development of projects and control and decision rooms. While Barco brings its knowledge, advice, expertise and necessary services for the best choice of the latest generation of videowall systems, GESAB add its own know-how, experience and professionalism both on technical consoles and furniture as in the global project from ergonomic studies to the interior design. The alliance of the two companies has been strenthened this time for their collaboration in Colombia, with the creation of a corporate showroom where the visitors can see the seamless integration of the products of the two companies, both in visual and technical furniture, particularly designed for 24/7 technical environments. Both companies already had presence in the Andean region, and now there is a special place to see, touch and feel the emotions that provoke environments with these details, with clean lines and minimalist, compounds with high quality materials and a unique design that provides high added value. Definitely, a unique opportunity to see a technological environment seamlessly integrated and a starting point for new projects, where you will discover the best audiovisual solutions and Advantis NG console, a perfect machine with exquisite design and personality for your control room with maximum ergonomics and perfect cable management. If you are planning a visit to the showroom, contact us now and enjoy a unique experience.